Our new Twitter account has passed over 100 followers in just a few days and we are already close to 100 posts. 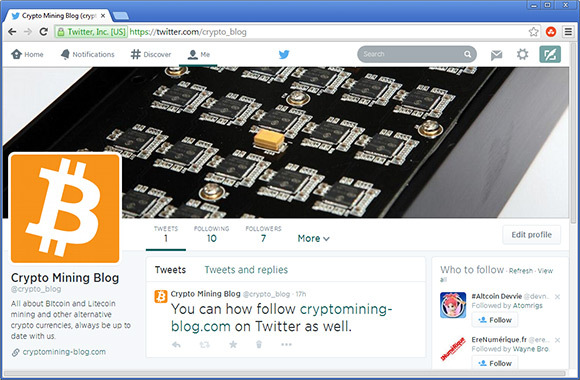 You are welcome to join in and follow us on Twitter for faster and more crypto currency updates, along with some interesting information that not always gets published here on the blog. Interesting crypto news, new altcoin launches, along with info on articles we publish here on the blog, this is an easier way to keep updated with what is new in the world of crypto currencies. We have just set up an official twitter account for the blog where you will be able to keep track not only on what new is getting published here, but will also be able to get some additional useful information. Not to mention that our twitter followers will also get to read about things that may not get published here on the blog, as it is quite hard to cover absolutely everything in detail, but short updates in the form of tweets are fast and easy. So if you are using Twitter and like the blog, you might want to follow us there as well, and if still not using Twitter, then you may just have a good reason to start using it now.